We were really lucky to get almost the last tickets to the Young Vic’s huge smash hit, Yerma, starring Billie Piper – although you can queue for returns at the theatre from 6.30 pm, 1.30pm for matinees. As the theatre is based in The Cut close to Waterloo and the South Bank, it’s a really vibrant area with loads of restaurants and bars, so it’s actually worthwhile hanging out in the queue for a while on one of these hot evenings we’re having, then sloping off for supper if you don’t get a seat. If you do get a seat – goodness me, it’s a bumpy ride. This play is truly harrowing, and brings up a lot of issues. The word ‘yerma’ means barren, and the action charts the downward spiral experienced by Billie Piper’s character as she becomes more and more desperate to have a baby. The desire consumes her and all her relationships suffer. I won’t give everything away, but I will say it does make you think deeply about your own life, whether you have children or not. Billie Piper is astonishingly good in the role. She has had so many reinventions, from teen pop star, to girl bride of Chris Evans (shiver) to Dr Who moll (the only one, in my view, who has ever been a proper match for the Doctor). She always seems to exceed expectations. Yet her ability to plumb the depths in Yerma suggests she has known despair too. The set was brilliant, encasing all the characters in a glass box, like butterflies on pins, so their every move could be scrutinised and pitied. How sad and true it all was. A lot of awards coming the Young Vic’s way soon, I bet, and they’re so well deserved. I’m not sure any other theatre has made me think so much in recent years. Having tried unsuccessfully for a baby until the age of 40, I can imagine only too well the emotion of this play. When I found out I was pregnant on my 40th birthday, I was over the moon. I love Billy Piper too, so might drag my bum off a chair to see it. So glad your story had a happy ending with the lovely Kay who has done you proud! 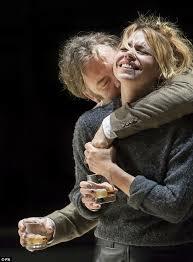 Yerma is quite traumatic but Billie Piper is absolutely brilliant, well worth seeing if you are a fan. Hope you get tickets!